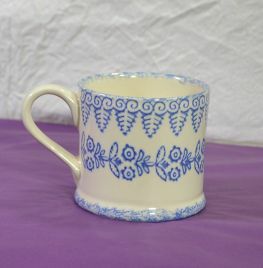 Lacy Blue design Mug from Brixton Pottery. Capacity of 250ml, perfect for your morning cup of coffee. Delicate blue design on a lovely off white pottery mug. 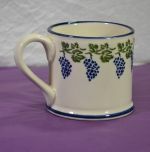 Perfect as a gift for someone you love along with the Grapes and vine version also from Brixton pottery. Dishwasher & microwave safe.